We believe "The Child Comes First"
KIDS Campus aims to ensure the time children spend with us will be happy, successful and rewarding for both parents and children. We believe this can best be achieved via co-operation of parents and teachers working together for the benefit of your child. KIDS Campus believes “language”, whether mother tongue or foreign, is a tool for communication. Communication is necessary for people to create social lives, express wishes, emotions and thoughts. People face “obstacles” when dealing with cultures and language. Through interaction with people, “obstacles” become doorway to eye-opening experiences in differences and similarities in intercultural contact and international understanding. Child Development is recognized as a complex area requiring attention to individual needs. These needs are – knowledge , attitude , sense of value , and skills. These needs differ according to the age of the child. KIDS Campus places great importance on “language education” and child development – a combination of mother tongue, foreign language, and human development, to help children learn a richness of individual self-expression. This is the KIDS Campus vision. In the future, when your child leaves their nest and flies out into the world, they will have pride in themselves. They will also accept others as they are, and be accepted by others as they are. This is our lifework – to help your child build their very own brighter tomorrow. 1. Children are able to learn in a fun, relaxed environment! Bright, colorful classrooms where children can enjoy what they learn while they are learning. Because learning should be a fun experience! This is what sets KIDS Campus apart from other English conversation schools. KIDS Campus recognizes an important part of a child's learning is conducted through play. For this reason, KIDS Campus has created a “PLAY ROOM”. Here, children can learn as well as apply what they have learned in their lesson, in the “PLAY ROOM”. For 2 and 3 Hour Courses – Lessons are conducted in 2 classrooms. During the first hour of the lesson, children participate in workbook, craft, singing and circle time activities. During the second (and third) hour, the lesson is conducted in the “PLAY ROOM”. Children are encouraged to speak, play and use gestures in a natural, native English speaking style environment. 2. A Rich Variety of International Teachers! KIDS Campus aims to give children opportunities to experience, learn and feel many new things to give them the tools to create a future of their own choosing. With these goals in mind, KIDS Campus employs a number of foreign native English speaking teachers. KIDS Campus teachers come from different countries and different backgrounds. 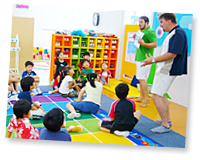 KIDS Campus teachers bring to the classroom interesting and colorful hobbies and life experiences. Cross cultural elements are blended into lessons, designed to draw out the interests and individuality of children. Children eagerly look forward to each lesson and actively participate in their own learning. Japanese Teachers, Native English Speaking Teachers and Early Child Care Teachers. We are an English Conversation School designed with children specifically in mind. Teachers employed at KIDS Campus understand each child is a unique individual. Teachers understand that each child has specific needs. All teachers at KIDS Campus have completed in-service training at Preschools or Day Care Centers either overseas or domestically at International Schools. Depending on the type of class and course, KIDS Campus employs experienced certified Early Child Care Teachers who provide care and attention to your child. That is the KIDS Campus assurance – WE CARE! Cultivating Your Child's Ability to Communicate. 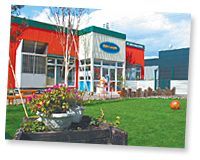 KIDS Campus schedules a number of events and functions that take place outside of the classroom. These events offer input opportunities for children that help to provide a sense of fun and a desire to CONTINUE learning English. 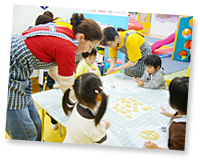 Mother and Child Overseas Preschool Program. To help provide motivation for children to keep learning English and challenging new ideas about the way in which they use language, KIDS Campus has developed the Mother and Child Overseas Preschool Program. These exciting programs give children a chance to use language gained at KIDS Campus and at the same time, interact with native English speaking children their own age. Naturally use language input gained at KIDS Campus. Learn new language native English speaking children their own age use in daily situations. Meet and make friends with native English speaking teachers and children. Learn about the culture of the language through natural daily situations. Parents who participate in the Mother and Child Overseas Preschool Program have the opportunity to view firsthand how their child adapts to the Preschool classroom, and how their child interacts with and makes friends with native English speaking children. Children learn English for different reasons. There is an American singer who I really love. I want to sing my favorite singer's songs in English. When I grow up I want to go and meet her and be able to speak to her in English. My dream is to become a soccer player! Some day when I play for Japan in the World Cup I will need English. That's why I am learning English. When I watch TV and I hear some English I know, I think “Hey, I know what they are saying!” It makes me feel so happy. When I get older, I want to go overseas and learn about drawing pictures. I think it would be really great if I could talk to other people about drawing pictures in English. When I went to Hawaii with my family, some Americans spoke to me in English and I wasn't even nervous. I felt good because I was able to talk to them and they understood what I said. Wow! Names of students have been changed to protect their identity and privacy. KIDS Campus understands the importance of what children have personally experienced, seen or felt and use this as a base for learning. Our goal is your goal – To create opportunities for children to discover what they want to gain from learning English. These opportunities will help children create a better future – THEIR FUTURE!